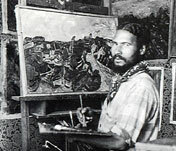 The William H. Johnson Foundation for the Arts was established in 2001, the centenary of the birth of William H. Johnson. Inspired by Johnson's story, the Foundation sought to encourage early-career African American artists by awarding annually one $25,000 William H. Johnson Prize and at least one $1000 Finalist Prize. Visual artists working in all media were encouraged to apply, and between 2002 and 2017, more than $400,000 was awarded to 16 Prize Winners and 25 Finalists. Janine Barrois, Ralph Clark, Robert C. Davidson, Jr., William J. Galloway, Eungie Joo, Dee Kerrison, Bernard Kinsey, Arthur Lewis, Hau Nguyen, V. Joy Simmons, M.D. and Franklin Sirmans. Extraordinary financial support was provided by JoAnn Busuttil, Eileen Norton and the Steve Martin Charitable Trust. The jury process was organized by Rebecca Snodgrass (2002-2014) and Kris Kuramitsu (2015-2017). Thank you to every artist who submitted an application; every juror who served on a selection committee and every supporter who made a donation.